Were Hedge Funds Right About Deserting Vale SA (VALE)? As we already know from media reports and hedge fund investor letters, many hedge funds lost money in fourth quarter, blaming macroeconomic conditions and unpredictable events that hit several sectors, with technology among them. Nevertheless, most investors decided to stick to their bullish theses and their long-term focus allows us to profit from the recent declines. In particular, let’s take a look at what hedge funds think about Vale SA (NYSE:VALE) in this article. Is Vale SA (NYSE:VALE) a healthy stock for your portfolio? The smart money is getting less optimistic. The number of long hedge fund bets were trimmed by 2 in recent months. Our calculations also showed that VALE isn’t among the 30 most popular stocks among hedge funds. VALE was in 33 hedge funds’ portfolios at the end of the fourth quarter of 2018. 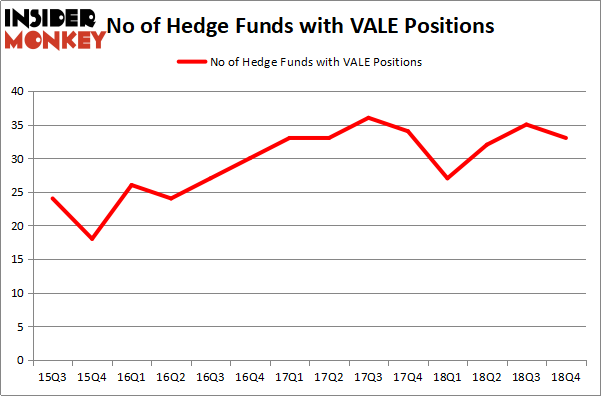 There were 35 hedge funds in our database with VALE holdings at the end of the previous quarter. Let’s go over the new hedge fund action surrounding Vale SA (NYSE:VALE). How are hedge funds trading Vale SA (NYSE:VALE)? At Q4’s end, a total of 33 of the hedge funds tracked by Insider Monkey were bullish on this stock, a change of -6% from one quarter earlier. On the other hand, there were a total of 27 hedge funds with a bullish position in VALE a year ago. With hedge funds’ positions undergoing their usual ebb and flow, there exists a few notable hedge fund managers who were increasing their holdings significantly (or already accumulated large positions). Among these funds, Orbis Investment Management held the most valuable stake in Vale SA (NYSE:VALE), which was worth $611.3 million at the end of the third quarter. On the second spot was Fisher Asset Management which amassed $495 million worth of shares. Moreover, AQR Capital Management, Capital Growth Management, and Contrarian Capital were also bullish on Vale SA (NYSE:VALE), allocating a large percentage of their portfolios to this stock. Since Vale SA (NYSE:VALE) has witnessed bearish sentiment from the smart money, it’s easy to see that there is a sect of fund managers that elected to cut their full holdings heading into Q3. Interestingly, Robert Bishop’s Impala Asset Management dumped the biggest investment of the “upper crust” of funds tracked by Insider Monkey, worth about $72.7 million in stock. Mike Masters’s fund, Masters Capital Management, also dumped its stock, about $29.7 million worth. These moves are interesting, as total hedge fund interest fell by 2 funds heading into Q3. Let’s go over hedge fund activity in other stocks similar to Vale SA (NYSE:VALE). We will take a look at Anthem Inc (NYSE:ANTM), CME Group Inc (NASDAQ:CME), ASML Holding N.V. (NASDAQ:ASML), and Banco Bradesco SA (NYSE:BBD). This group of stocks’ market valuations are closest to VALE’s market valuation. As you can see these stocks had an average of 37.25 hedge funds with bullish positions and the average amount invested in these stocks was $2129 million. That figure was $2037 million in VALE’s case. Anthem Inc (NYSE:ANTM) is the most popular stock in this table. On the other hand ASML Holding N.V. (NASDAQ:ASML) is the least popular one with only 16 bullish hedge fund positions. Vale SA (NYSE:VALE) is not the least popular stock in this group but hedge fund interest is still below average. This is a slightly negative signal and we’d rather spend our time researching stocks that hedge funds are piling on. Our calculations showed that top 15 most popular stocks among hedge funds returned 19.7% through March 15th and outperformed the S&P 500 ETF (SPY) by 6.6 percentage points. Unfortunately VALE wasn’t in this group. Hedge funds that bet on VALE were disappointed as the stock returned 0.1% and underperformed the market. If you are interested in investing in large cap stocks, you should check out the top 15 hedge fund stocks as 13 of these outperformed the market. Were Hedge Funds Right About Buying Costco Wholesale Corporation (COST)? Hedge Funds Have Never Been This Bullish On Thermo Fisher Scientific Inc. (... Were Hedge Funds Right About Dumping Twenty-First Century Fox Inc (FOX)? 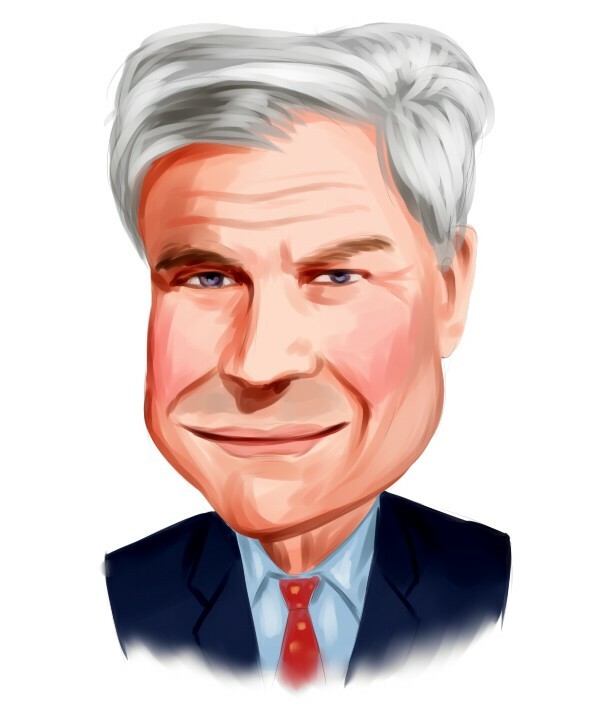 Itau Unibanco Holding SA (ITUB): Are Hedge Funds Right About This Stock? Do Hedge Funds Love Diageo plc (DEO)? Were Hedge Funds Right About Buying United Technologies Corporation (UTX)?